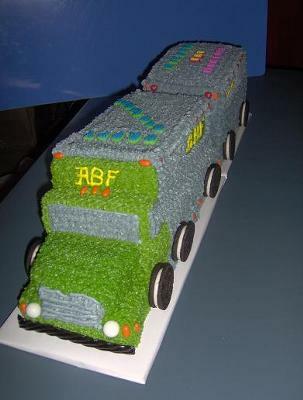 I did this truck cake for my sister. She was responsible for the cake this month where she works. The company is called ABF. I made 2 - 9" x 13" chocolate cakes. I also used 2 white cake mixes and made 4 loaf size cakes. I used buttercream icing colored grey, green and yellow. The company's colors. Remember to level all cakes! For the first part of the truck I used the chocolate cakes. I cut the cakes into 2 sections, right down the middle. Each piece is 4 1/4" wide and approx. 12 1/2" long. You will have 4 equal pieces. I used all 4 pieces and stacked them with icing between layers. I trimmed the layer next to the bottom to look like the hood of the truck. For the 2nd trailer I used 3 of the white loaves, and iced between layers. I used orange tic-tacs for the running lights, red hots for the brake lights, white gum balls for the head lights and black licorice for the bumpers. I used oreo cookies for the wheels. Finally, I used pre-made candy letters to spell out happy birthday and their names on top of the trucks.